Pub a short walk from Whitechapel Station. They serve food every day including Sundays, and have a couple of real ales. At the time of Howard's visit they served Fuller's London Pride and Old Speckled Hen, both well-kept. Friendly staff and two resident cats dozing in front of the coal fire. 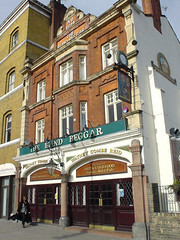 The Blind Beggar is notable both in Salvation Army history (William Booth preached his first sermon just outside) and East End history (Ronnie Kray shot George Cornell to death while the latter was sitting at the bar here); see the Wikipedia link below for more details. Last edited 2013-01-23 16:19:33 (version 8; diff). List all versions. Page last edited 2013-01-23 16:19:33 (version 8).